Assist us mercifully with your help, O Lord God of our salvation, that we may enter with joy upon the contemplation of those mighty acts, whereby you have brought hope to the world. Almighty God, whose most dear Son went not up to joy but first he suffered pain, and entered not into glory before he was crucified: Mercifully grant that we, walking in the way of the cross, may find it none other than the way of life and peace. Amen. 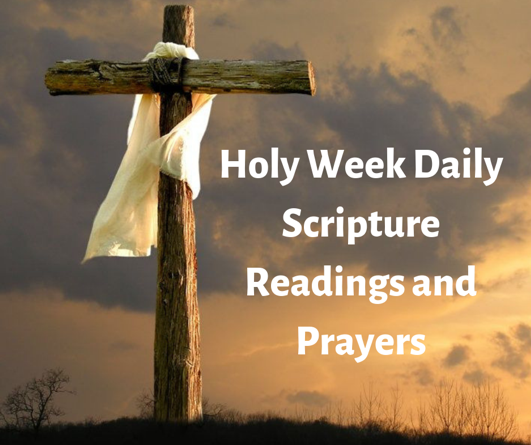 ­-The Prayer for the Monday in Holy Week from the Book of Common Prayer. Almighty God, whose Son our Savior Jesus Christ was lifted high upon the cross that he might draw the whole world to himself: Mercifully grant that we, who glory in the mystery of our redemption, may have grace to take up our cross daily and follow him. Amen. -The Prayer for Holy Cross Day from the Book of Common Prayer. While we were still your enemies, Lord Jesus Christ, you suffered and died for us and the whole world, winning victory over death. Give us grace to lift you up as we follow the way of your cross this day, so that all people may be drawn to you and know your reconciling and healing grace, mercy, and love. Amen. Almighty Father, whose dear Son, on the night before he suffered, instituted the Sacrament of his Body and Blood: Mercifully grant that we may receive it thankfully in remembrance of Jesus Christ our Lord, who in these holy mysteries gives us a pledge of eternal life; and who now lives and reigns with you and the Holy Spirt, one God, for ever and ever. Amen. Lord Jesus Christ, you knelt to wash our feet. Teach us to humbly serve one another and our neighbors so that the world may know we are your disciples. Amen. Jesus Christ is risen today…Alleluia! Who did once upon the cross…Alleluia! Suffer to redeem our loss…Alleluia!